Mysuru, Feb. 7 (RKB&DM) – A day-long Executive Committee meeting of District BJP began at Rangalakshmamma Rajaram Kalyana Mantap in Hootagalli here this morning. 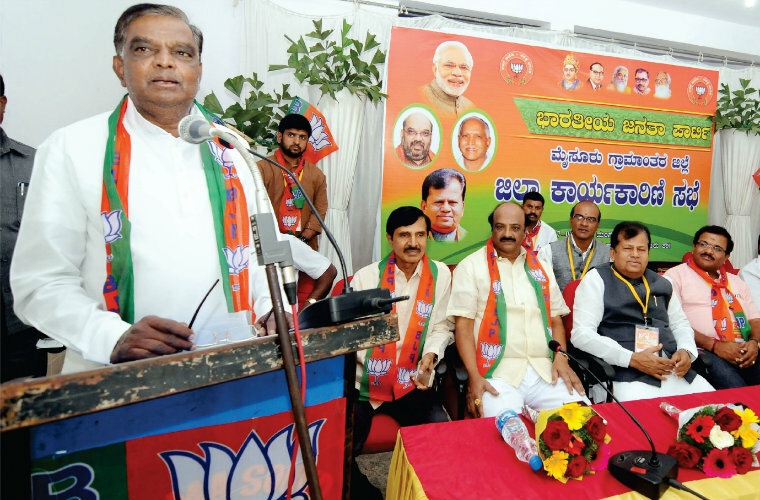 Addressing the meeting, District BJP President M. Shivanna said that Nanjangud and Gundlupet bypolls were crucial for the party. Calling upon partymen to shun whatever minor differences they had, Shivanna highlighted the role of grassroot level party workers in ensuring victory of the party candidates. Stating that the BJP has chosen senior dalit leader V. Sreenivasa Prasad as the party candidate for Nanjangud bypoll, Shivanna called upon partymen to give their best to ensure the victory of Sreenivasa Prasad in the bypoll, which is likely to take place in the first week of April. Sreenivasa Prasad, in his inaugural address, said that in 2014, BJP candidate Pratap Simha, a political greenhorn, won the Mysuru-Kodagu Lok Sabha seat with a comfortable margin despite the strong presence of Congress and JD(S) in Mysuru region and asked the partymen to take note of this and strive to strengthen the party in all Assembly segments of the district. Pointing out that Mysuru has a dynamic MP in Pratap Simha and that the BJP has charismatic leaders such as B.S. Yeddyurappa, K.S. Eshwarappa and Ananthkumar, Prasad called upon the partymen to focus on the by-polls for now. He further said that he would extensively tour all Assembly segments of Mysuru and Chamarajanagar LS seats. Mysuru Vibhagiya Pramukh N.V. Phaneesh too spoke. Sreenivasa Prasad was felicitated on the occasion. District BJP Vice-President S. Mahadevaiah, ZP Vice-President Nataraj, BJP Slum Morcha President Kautilya Raghu, former MUDA Chairmen K.R. Mohan Kumar and C. Basavegowda, former ZAK Chairman Nanjundaswamy and others were present. Earlier, Sreenivasa Prasad speaking to presspersons at the venue before attending the meeting, said that he was eager to learn about the party’s organisation. Welcoming the Union Budget, Prasad said that it was a balanced one giving equal importance to all sections of society. Prasad likened the Governor’s address at the joint session yesterday to that of a school head master who is totally reluctant to issue a negative character certificate even though the student is bad in behaviour. When his attention was drawn to former CM H.D. Kumaraswamy’s prediction that the State Government would collapse soon, Prasad said that it is HDK’s own opinion and he would not like to comment on it. Replying to a question on Congress party’s bid to pitch JD(S) leader Kalale Keshavamurthy against him for Nanjangud bypoll, Prasad sarcastically said that the Congress would come up with 30 names in 30 days and he was not bothered about it.